AVITUS, (Date Unknown), a martyr in Africa, nothing else certain is known of him. However, there are sources who advance the theory he may be the same St. Avitus who is venerated as the Apostle to, and first Bishop of, the Canary Islands. CANDIDA, an anchoress near the monastery of St. Stephen of Bañoles in Catalonia, which had been founded by her son St. Emerius (vide infra). St. Candida reposed circa 798. DATIUS, REATRUS (RESTIUS), and 28 COMPANIONS; DATIUS (DATIVUS), JULIAN, VINCENT, and 27 COMPANIONS; and LUCIUS of AFRICA, and 40 COMPANIONS, (Fifth or Sixth Century), three distinct groups of Christians in Africa Proconsularis who were martyred by the Arian Vandals for the faith. Aside from these few names, no information on their lives is extent. DEVOTA, the patron-saint of both Corsica and Monaco, St. Devota was a virgin-martyr in Corsica who was subjected to great torture and finally martyred either on the rack, or by stoning in the Diocletianic Persecution circa 303. After her repose, the Prefect ordered her body be burnt to prevent veneration. However, before the Romans could carry out the Prefect's orders, Christians rescued her body and took it to Africa where it received a Christian burial. Later relics were translated to Monaco and enshrined in the Sainte-Dévote Chapel. EMERIUS, (Eighth Century), founding Abbot of the Monastery of St. Stephen of Bañoles in Catalonia. His mother, St. Candida (vide supra), lived as an anchoress near the monastery. JULIAN of LE MANS, (Date Uncertain), according to the Roman Martyrology , St. Julian was consecrated Bishop by the Apostle Peter (29th June), who then sent him to evangelise in Gaul. However, as most martyrologies place him in the third century, he could not have been consecrated by the Apostle Peter. Regardless, he did serve as the first Bishop of Le Mans, and evangelised the area, bringing many people to Christ. JULIAN of SORA, a native of Dalmatia who was arrested, tortured, and beheaded in Sora in Campania in a persecution of Christians during the reign of Antoninus Pius (r. 138–161) circa 150. LUPUS of CHÂLONS, tenth Bishop of Châlons-sur-Saône, and friend of St. Gregory the Dialogist (3rd September). St. Lupus was renowned for his charitable acts. He reposed circa 610. MAURUS (MARIUS, MAY), the founding Abbot of the Abbey of Val Benoit (Bodon Abbey), near Sisteron, in present-day France. St. Maurus reposed in 555. NATALIS, (sixth century), St. Natalis was a spiritual child of St. Columba of Iona (9th June), and the founder of monasticism in Ulster. He served as Abbot at St. Naul’s, Inver (Co. Donegal), Kinawley (Cill Naile, Co. Fermanagh), Inver Naile (at Raphoe, Co. Donegal) and at Devenish (Daimhinis) Island where he was the successor of St. Laisrén mac Nad Froíc (18th April). His holy well at Kinawley Church is still venerated. THEODORIC II of ORLEANS, a monk at the Abbey of Saint-Pierre-le-Vif in Sens. St. Theodoric served as a Royal Councillor, and later was consecrated Bishop of Orleans. He reposed in 1022. VITALIAN, seventy-sixth Pope of Rome (657–672). 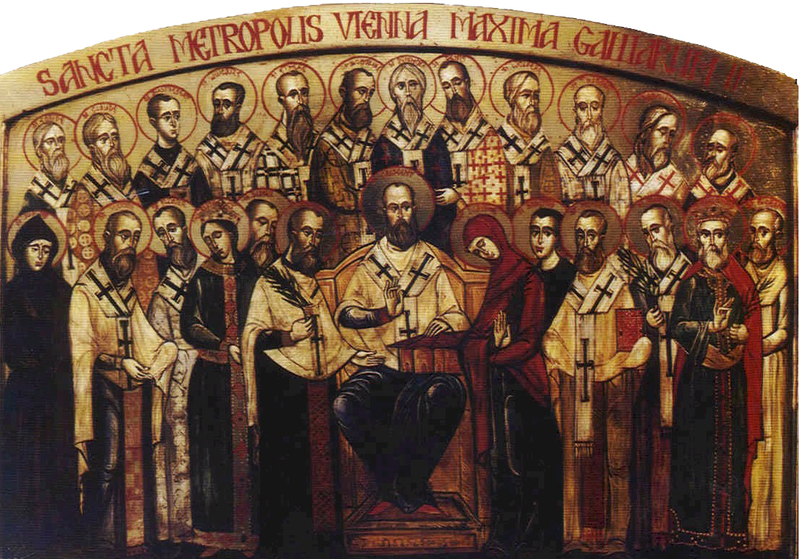 Much of his pontificate was occupied with unending conflict with those prelates who supported Monothelitism. St. Vitalian also consecrated St. Theodore of Tarsus (19th September) as Archbishop of Canterbury and sent them to England. He reposed in 672, and is buried at St. Peter's Basilica, Rome. ALEXANDER of ROME and COMPANIONS, (Date Unknown), there are two St. Alexanders commemorated today. Their lives have become somewhat intertwined, possibly as a result of errors by ancient copyists. The first St. Alexander is said to have been a Roman martyr who was joined in his confession and death by thirty-eight others. ALEXANDER of SOLI, AMMONIUS, and COMPANIONS, (Date Uncertain), the second St. Alexander commemorated today. Along with St. Ammonius and thirty-eight others, are believed to have been martyred at Soli, in Cyprus. As stated with St. Alexander of Rome (vide supra) it is quite possible the information that has come down to us is muddled with the Roman martyrs. The Roman Martyrology states this group was also martyred in Rome, whilst in the Acta Sanctorum , the Bollandists add another twenty to the total number of martyrs and place their martyrdom in either Africa or the East. ALTO, originally from either Scotland or Ireland, St. Alto travelled to Bavaria, settling as a hermit in a forest near Augsburg. His reputation for holiness soon attracted many disciples, resulting in St. Alto building an abbey now called Altomünster in his honour. His Life was written sometime in the second half of the eleventh century, theoretically based upon oral history which very well might contain embellishments. St. Alto reposed circa 760. AMMON, DIDYMUS, EMILIAN, LASSA, POËMUS, and COMPANIONS, (Date Uncertain), a group of forty-four Christians, of whom only these five names are known, martyred in Membressa in Africa Proconsularis (present-day Majaz al Bab, Tunisia). No further information is extant. ANSBERT, chancellor at the Court of Chlothar III (r. 658–673). St. Ansbert and his wife agreed to separate and receive monastic tonsure. St. Ansbert was tonsured at the Abbey of St. Peter (later the Abbey of St. Wandrille) in Fontenelle, Normandy in 673, six years later, he was elected Abbot. Following the repose of St. Ouen of Rouen (24th August) in 684, St. Ansbert was consecrated Bishop of Rouen. St. Ansbert reposed circa 700. CRONAN the WISE, (Eighth Century), the little known of this saint leads to the conclusion that he was, in all probability, a Bishop of Lismore, and identical with the holy prelate known there as St. Roman. St. Cronan was best known for his zeal, ability, and success in the regulating of ecclesiastical discipline, and was the author of many sets of disciplinary laws. CUARAN (CURVINUS, CRONAN), this Irish saint, who, like many others, was known as “The Wise”. St. Cuaran attempted to conceal his identity and assume the life of a simple monk at Iona, however, he was eventually recognised by St. Columba (9th June). He most likely reposed well into the eighth century. EINGAN (EINION, ENEON, ANIANUS), he is believed to have been one of the two sons of the famous chieftain Cunedda, whose family is said to have produced no less than fifty Saints. St. Eingan was a British prince who left Cumberland for Wales, where he finished his days as a hermit at Llanengan near Bangor, reposing circa 590. NEBRIDIUS, a Bishop of Egara (present-day Terrassa) 24 km / 15 mi north-west of Barcelona. St. Nebridius was consecrated Bishop of Egara in 516 occupying that See until 527. In 540 he was translated to the See of Barcelona where he served until his repose circa 545. PRIMUS and DONATUS, deacons in Africa Proconsularis, martyred by Donatists in 362. SABINUS, a Bishop of Canosa in Puglia (Apulia) southern-Italy. The See was subsequently subsumed by a part of what is now the Archdiocese of Bari-Bitonto. St. Sabinus is said to have ruled his See for over half a century. Beyond the zeal in caring for his own flock, St. Sabinus served as Pope St. Agapitus I's legate to the court of Emperor Justinian I (r. 527–565) at Constantinople from 535 to 536. He reposed circa 566, and his relics are enshrined at Bari. TEIO (TEILIO, TEILUS, THELIAN, TEILAN, TEIOU, TELIOU, DILLO, DILLON), it is difficult to sort through the mass of conflicting traditions concerning this famous saint of South Wales and compile a reliable account of his life. However, it is fairly certain that he was a disciple of St. Dubritius (14th November), friend of SS. Samson (28th July) and David (1st March), and was the founder of the monastery at Llandeilo Fawr. Records exist of his pilgrimages to Rome and Brittany, where churches bear his name. Legends exist of him having been consecrated bishop at Jerusalem while on a pilgrimage to the Holy Land. He is also said to have succeeded St. Dubricius in the See of Llandaff. St. Teio reposed at Llandeilo Fawr in 560.